It really was a dark and stormy night when I figured out what Elite: Dangerous was. Forgive the tangent, but new eaves troughs (or gutters, if you will) have been installed on my parents’ house. One night, they asked me to come over to their place, haul the scrap metal that was the old eaves away, and deposit the unwanted material at the local dump. While I was sitting at a red light, heading towards the dump, watching the rain bounce off my windshield, it finally occurred to me that I had been doing this all day. I should clarify that I wasn’t stuck in a time loop or anything; this was the first and only time I had taken on this particular job, but I had been hauling cargo around the universe all day in Elite: Dangerous. 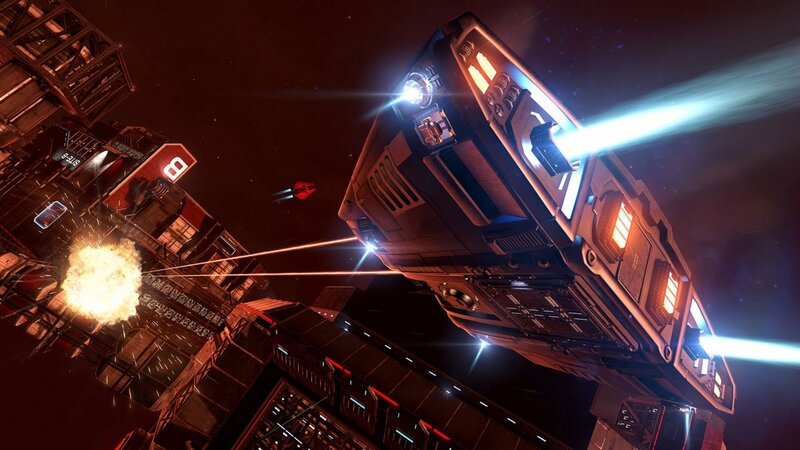 Elite: Dangerous is an open-world, space-based cargo hauling simulation if you want it to be, and trust me, in the beginning, you want it to be. There is a long stretch at the start of this game where you’re pathetically unprepared for the galactic aggression you can suddenly find yourself facing. You start off with a beginner’s spaceship that someone loaned you and you’re told to seek adventure and find wealth. How you do that is up to you; so much so, that you’re not given any direction once a new game is started. After a bit of money is earned from hauling cargo, you can buy better ships or parts. Eventually, you can turn the game into a bounty hunting, space shooting, illegal cargo smuggling, assassinating, piracy game; however, that’s only if you choose to take on these roles. After watching a few YouTube tutorials made by the game’s developer, and playing some of the game’s training scenarios, I started stumbling across the universe looking for work. My adventures found me crossing my fingers as my haul full of illegal drugs threatened to rip itself apart because I was running silent (risking damage by closing all exhaust ports to remove my ship from the radar displays of others) in order to get past a police patrol. There were moments when I was minding my own business and then suddenly fighting for my life as a pirate came out of nowhere with the intent of ending me. There are times when the game would generate a random event for me, and I couldn’t be sure if I’d find space junk or combat; however, there was always excitement associated with the prospect of finding something profitable floating in space. Unfortunately, Elite: Dangerous is a simulation of captaining a space ship first, and a videogame second. Unlike many story-driven experiences, your time in-game is never plotted out on some graph ahead of time. 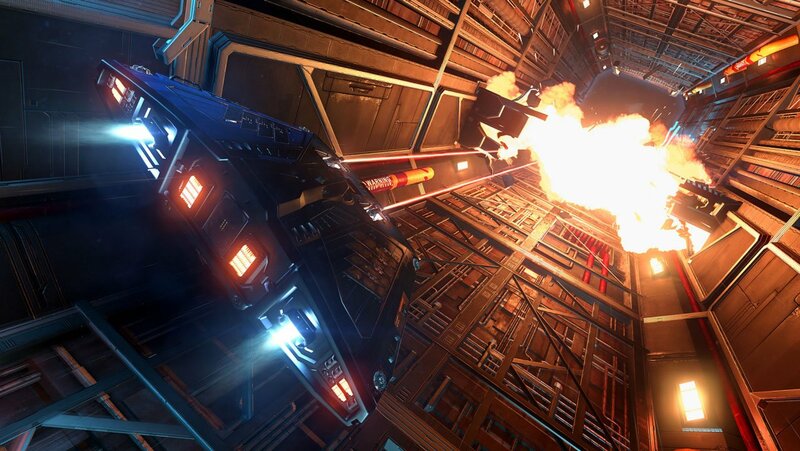 The development team has as much of an idea of what you’re going to do in Elite: Dangerous as you do. As a result, for every pirate encounter or police patrol or bounty you can hunt; expect a lot of flying around space looking for ports to dock with. Expect a lot of time when there is LITERALLY nothing to do except sit there and watch distant stars pass by. It helps the game’s visuals are so pretty, but after a while, the detail of the cockpit and the menus couldn’t hold my attention. It became normal to check social media while I waited for something to do. The feeling that your time might not be used perfectly continues when you realize that some ports have nothing to offer you in terms of real work. There will always be some sort of job posting for you, but it’s very frustrating to show up to a station and only find offers to pay above normal prices for some mineral or element. There are not even instructions on where to find the needed materials, just a request to bring them back if you happen to cross their path. The good news is that this is an issue but it isn’t the norm. You’ll usually at least find a contract from some mafia to haul illegal cargo to another destination. This probably makes me sound like a monster, but when the entire interface is some cold and clinical set of text-based menus, the cargo doesn’t really connect to the rest of the game in a meaningful way. Even when the cargo showed up as space slaves, there wasn’t much to do on my end but click a few menu options and take off. All that said, I am not trying to paint Elite: Dangerous as a bad game. It has a bit of a pacing problem, but it does a pretty decent job simulating something that doesn’t exist. Just leaving a space station requires you have to ask for permission to launch, leave the landing pad you were assigned, raise your cargo scope, raise your landing gear, proceed to the airlock at some appropriate speed, pass through the airlock, clear the airlock in a timely fashion (the game is really strict about that), and then leave the gravitational mass of the station. This is when you can travel between stars, and to do that you have to lock in a navigational route using your computer, line up with the correct star, ensure you have the right amount of fuel, ensure you’re out of the way of anything with a gravitational pull, and slowly accelerate to a speed that is faster than light. I won’t turn this into a technical manual, but once in space, you can also re-route the ship’s resources to different systems for more power and organize weapon groupings like you would in FTL: Faster Than Light. Actually, the only gameplay mechanic I didn’t like is the fact that missions have a real-world time limit to them. Unless your life is strictly scheduled down to the hour, there will probably come a time when you have to choose between your real-life responsibilities and your space captain ones. In the end, Elite: Dangerous isn’t a terrible game, but I don’t think it was made for mass appeal. Do you want to captain a starship in a way that lets you label the community of Star Trek Bridge Simulator as poseurs? Do you enjoy the calming experience of stars rushing past your window? Do star charts, cargo manifests, and the chance to be screwed over by some pirate excite you? Have you played Eve Online? Well sir and/or madam, do I have a game for you! For everyone else, I would suggest that you don’t look down at Elite: Dangerous, but you probably won’t find it enjoyable to play, either. 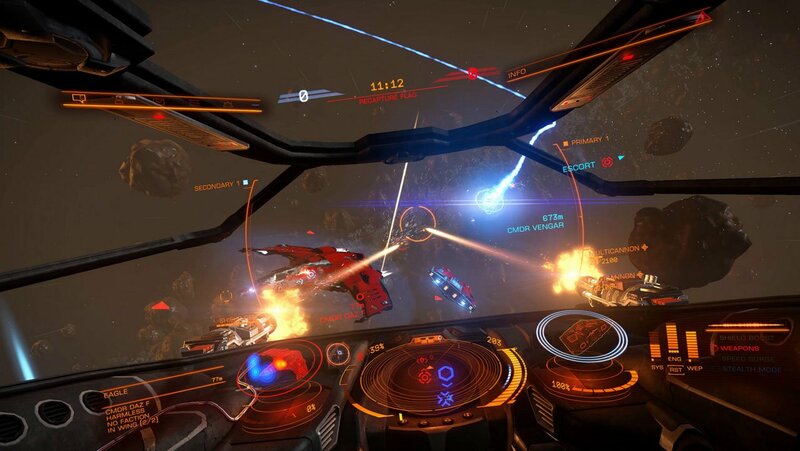 Elite: Dangerous is a simulation of captaining a space ship first, and a video game second.